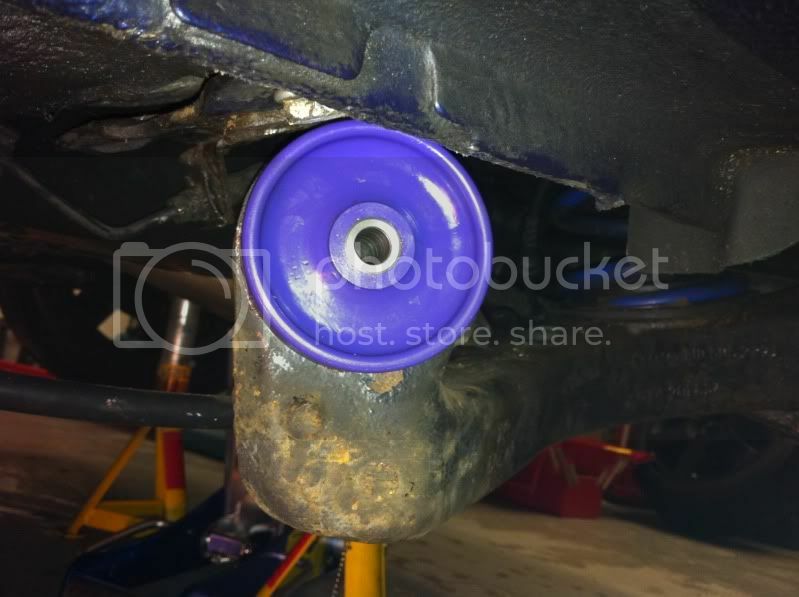 I've had problems adjusting my rear toe on my 4motion and after talking to others I decided to replace my trailing arm bushes which looked to be a right pig of a job. It is possible to do the whole thing without disconnecting the brakes and without removing the trailing arms. This helps save loads of hassle and a lot of time. Without guidance I managed to do both sides in just under 3 hours which I think is a reasonable amount of time for the job. As a positive side effect it is possible to carry out another modification giving even more rear adjustment. First out you need to raise and secure the back end which I did using a jack and axle stands. With both rear wheels removed you can now gather the tools needed. 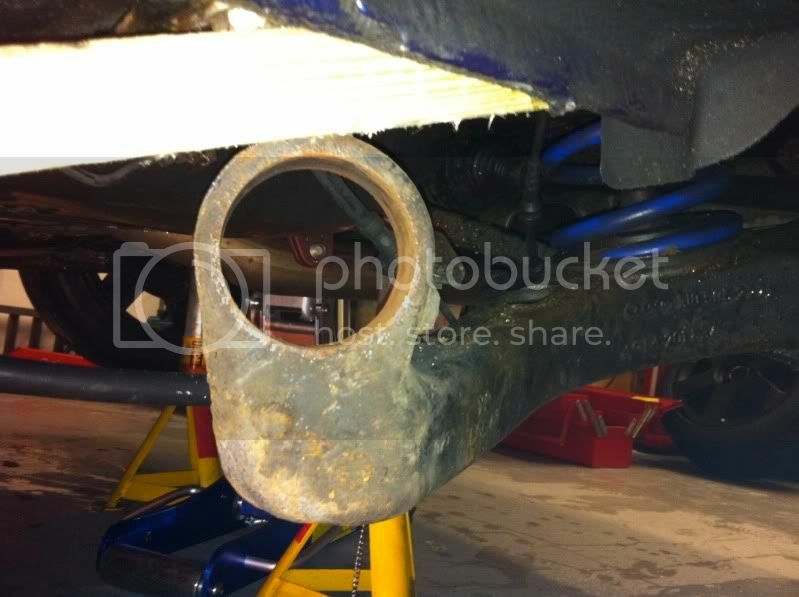 With the car raised and supported you need to undo the 4 bolts holding the trailing arm support bracket and on the passenger side unclip the brake pipe from its holders. 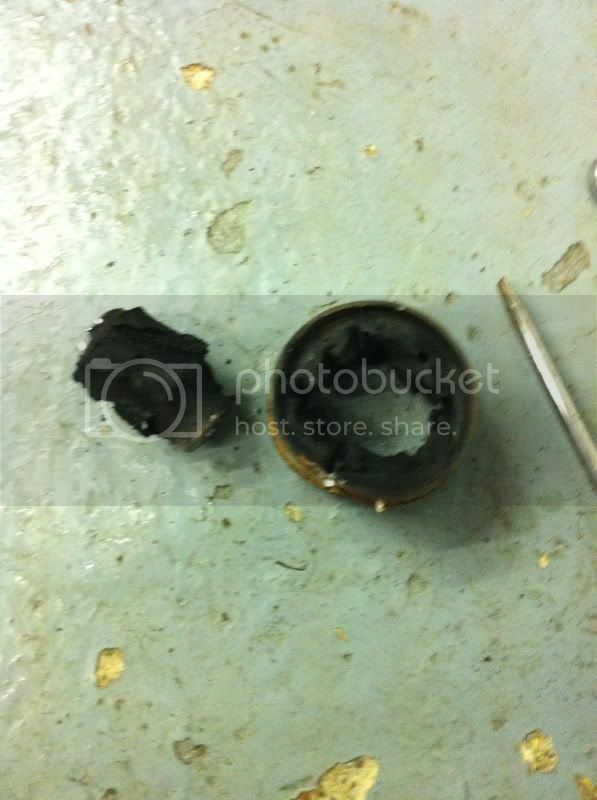 "note" on the drivers side you will need to cut a slot the width of the brake pipe in the bracket to allow removal. This does not compromise in any way as the clip then goes back on and covers the gap. With the bracket lowered you may need to ease it down some with a lever or piece of wood to access the bush retaining bolt. With this accessible and bolt removed lift away the bush housing. The bush will now be in clear view to drill out the centre and surrounding rubber. With the majority of the bush drilled out a soft drift will easily hammer out the rest. With the bush removed it is worth giving the face of the arm a good clean with a wire brush in a drill to removed any surface scaling or rust. In the next picture you can see the positioning of the wood to lower everything down to make it easier to reach. 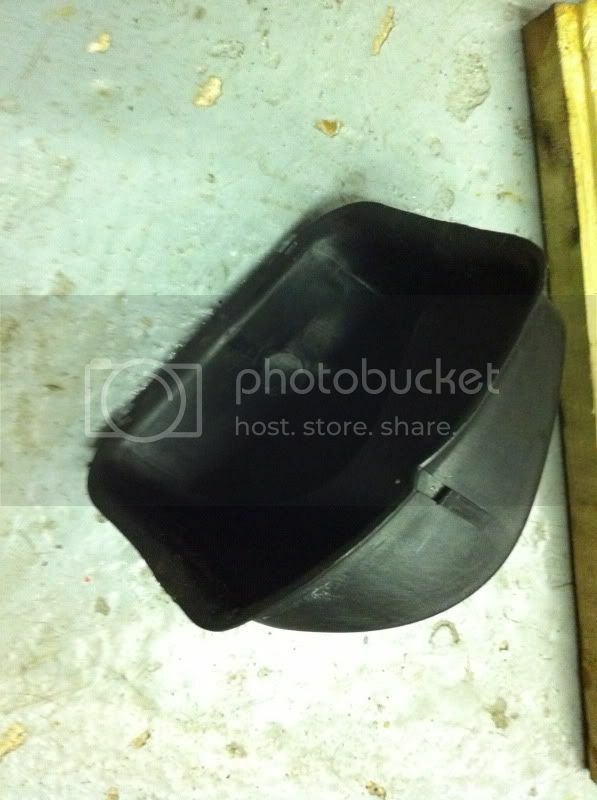 With this all prepared the new bush can be greased and positioned back into the housing. It is now that the plastic caps that are above this unit can be removed and disgarded. They hinder the adjustment available and serve little purpose. The chassis legs are heavily galvanized inside. Here is a picture of one of the caps when removed and if you look carefully you can see the marks from the bush retaining bolt. The refitting of everything is the reverse of removal but care needs to be taken and the toe set roughly by eye and then correctly adjusted with alignment tools. I like to use Super Tracker who have very accurate setting equipment. I'd like to thank Matt from United Motorsport for advice and sourcing the bushes for me. 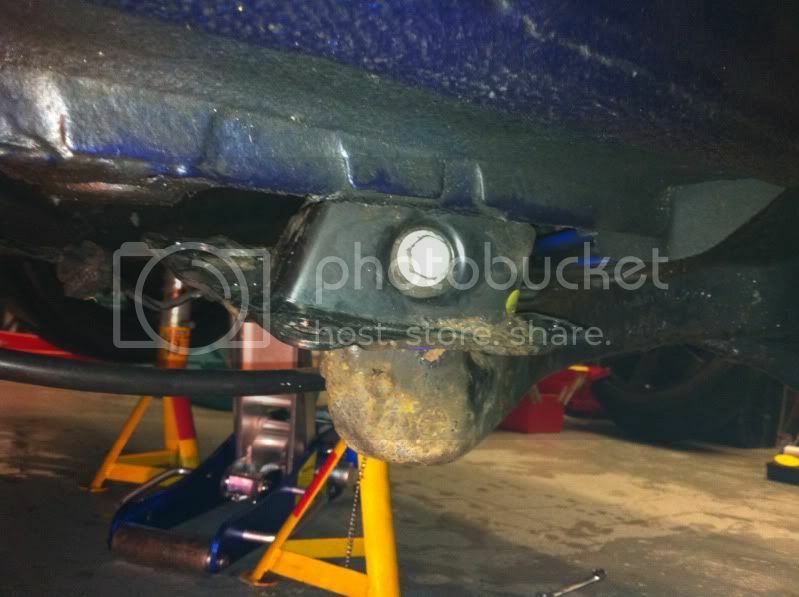 Did you renew the 4 bolts on each side holding the trailing arm support bracket? Did you renew the bush retaining bolt? Any need to make a bush puller tool? or did the polybushes slot in with 'ease'. Going to give this a go soon. I didn't need to replace any of the bolts. There was no rust or pitting but my car is a late one. The poly bushes go in easily. Could you please clarify where you cut the bracket. Is it necessary to detach the various lines running along the inner face of the trailing arms ? Location: Co Antrim, N. Ireland. The brake line passes through a bracket and to save disconnecting the line and having to bleed the system you can cut a slot the width of the brake pipe. Pull the pipe back and out of the bracket to free it. The reverse for replacement and re-secured with the clip. Having spent the morning under the car I see what you mean.